Yesterday afternoon, following a treatment of shockwave therapy to Bear’s recently injured right hind lateral suspensory ligament (in human terms a badly sprained ankle), I found him standing quietly facing the back of his stall. The light from the window reflected so perfectly on his noble face, and the shadowing was so beautifully dramatic, that I grabbed my Nikon D70, which I’ll be using a lot over the next four months while I document his recovery, and captured this moment of serenity. I did so carefully so as not to disturb his quiet reverie. The vet diagnosed his injury by ultrasound earlier this week and, needless to say, it’s taken a few days for me to find my equilibrium after such terrible news. This is serious requiring 24/7 stall rest, twice-daily hand walking and daily bandaging. I want to give him every opportunity to fully recover so will do everything I can to help make him comfortable and keep him amused. Fortunately he is in the care of a knowledgeable and enlightened horse woman, so I know he will be getting the best of care. This makes all the difference to my peace of mind on the matter. So, for the winter months Bear and I are truly dormant. Still, this quietude gives us lots of time to contemplate the next leg of our journey, and as long as we keep looking toward the light this shadow we are living under cannot last forever. 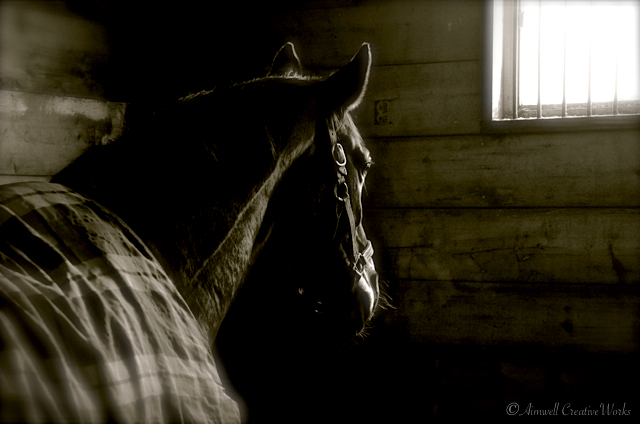 This entry was posted in Animals, Daily Post, Equestrian, Inspiration, Life, Photography, Reflections, Uncategorized, Weekly Photo Challenge, Writing and tagged Aimwell CreativeWorks, black and white, Daily Prompt, Dorothy Chiotti, Equestrian, Equine image, Horses, inspiration, Light and shadow, monochrome, Peace, Photography, postaday, shockwave therapy, suspensory ligament, Weekly Photo Challenge, winter. Bookmark the permalink. I am so sorry to read this. Your photo however is spectacular and captures the essence so well. Yes take care of both of you Dorothy! HUGS! Hesitated to click the ‘like’ button, because I don’t like the news. Sending you both peaceful, healing thoughts. Dorothy, first of all, that is a gorgeous photo-so great work! Secondly, fingers crossed for Bear. he is a beautiful horse, so grand and stately. Here’s hoping for a fast, painless, full recovery. Beautiful photo. I hope he recovers soon. The love you both share for each other will get you through this setback! What a beautiful photo of your boy!